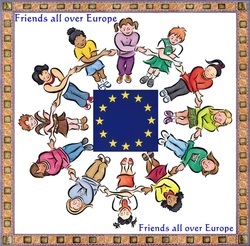 An eTwinning project implementing cross cultural and cross curricular approaches in an effort to enhance learners' reading, writing, listening as well as speaking skills, aiming at promoting their overall linguistic and communicative competence in English. A Greek/Spanish collaboration. E2 class is involved in this European eTwinning project for the school year 2011-2012. The students are communicating through a TwinSpace platform with students from Alameda Primary school, in Poblete, Spain. Students in both countries are really excited about this whole idea. A tentative schedule with particular common activities has been finalized. The children are ready to start their first one, that of introducing themselves. Check the students' texts in which they introduce themselves in the following e-booklet. The first video conference between students of the two schools is a fact! We actually saw and talked to each other live! Students were a bit nervous at first, but really excited! And after a few minutes they were actually enjoying it!! This eTwinning project is off for good, on a good track...Starting plannning our next activity now.. a Christmas card exchange... ;-) Stay tuned! Students from both schools created Christmas cards for their e-friends in the other side of Europe! They were really enthused with this whole project, and did their best to create something unique. The students of E2 class, chose their card to has the shape of the pomegranate, which in Greece symbolizes good luck, abundance, fertility, and strength, because they wanted to wish all these to their Spanish friends as well. We sent the cards by post and our friends' cards arrived one week later. Students were really impatient about receiving the cards and were thrilled when they actually got their hands on their e-pals cards! For more details check the slide show below. Another eTwinning activity was completed by the students! This time they used the blog tool of the Twinspace platform to post their entries. They had to talk about their likes/dislikes, hobbies and daily routine, and post their descriptions in the blog of the activity, so as their Spanish e-pals read about it. They were also eager themselves to read the Spanish descriptions, so there was quite an excitement! For more details on the Greek students' outcome have a look at the e-booklet that follows. Our next activity is now on the way! The students just completed a two-fold activity entitled "Our school-our timetable". They created PP presentations in which they included descriptions and photos of their school, as well as their school timetable. Check out their amazing work in the six team presentations that follow. "Our country - our city" is the title of the eTwinning activity prepared by the students of the two countries, in an effort to make their countries ans cities known to their European e-pals. Check out below the great PP presentations that students of E2 prepared in teams. The one before the last activity was completed by the students. They wrote blog entries in which they talked about their overall impressions and feelings regarding this eTwinning programme. Some farewell greetings and wishes were also included, in anticipation for the concluding activity tomorrow, in which we will all have the chance to say our goodbyes live in our last video conference. In the e-booklet below you can have a look at the students' blog entries. Our eTwinning project for this year ended successfully with the completion of the last scheduled activity: our last live video conference. Students were both excited for it and of course a bit sad because this was the end. Farewell greetings and summer wishes were exchanged, as well as a hope for a new collaboration next year. Amazing work, guys! Congratulations to all are in order!